All this talking about how great the web is, particularly for creating communities, got me thinking about the other, tarnished side of the coin. The internet IS AWESOME. Theres’s no denying it. But there are some crazy biatches out there, and the internet affords them the anonymity they need to really vent all their bitterness and resentment over how their lives have turned out. Trolling and web bullying has been highlighted in the news recently. A good few years ago now, before World of War Craft became popular, i used to play a (very basic) MMORPG called Legend Of Mir. It’s not like me to get engrossed in a computer game, but i think it was the sense of community that i loved, and i really got absorbed by Mir. I was in the middle of a messy break up and it distracted me from my pain and made me feel less lonely, and i ended up being really good at it; i became the leader of one of the oldest guilds and i ended up being on the website in the list of highest level Tao’s. There was the odd dickhead who played (probably a spotty 11 year old who hadn’t yet mastered the nuances of social interaction or similar), but on the whole i met some really lovely people, some of which i ended up meeting ‘in real life’ and whom remain dear friends to this day. I started to get funny replies to posts i made of the forums. They were kind of sinister, insulting but smart, and the person knew things about my personal life. The frequency and intensity increased over a period of time, and the person was using many different accounts, ‘sock puppets’ so that s/he could agree with themselves and make me look like an idiot. Friends ingame started to approach me to say they had received anonymous messages, warning them about me etc. I imagine there was a lot more that i didn’t know about, that people believed and so didn’t approach me about. I was also getting nasty anonymous messages. This went on for months, and in the end i was very paranoid, i didn’t know who to trust, i didn’t understand why someone would single me out and hate me so much that they would be so motivated to cause me harm. It was so strange and alien to me. If it had been letters in the post and not online, I’m pretty sure i would’ve called the police. It made me want to quit the game, quit the internet completely. It was scary to someone like me, a pacifist, a generally peaceful, laid back person. Maybe i should toughen up a bit. It’s complicated so i won’t bore you with the intricacies, but eventually i found out, beyond doubt, who it was. It was the old leader of the guild i took over, who obviously had harboured some passive-aggressive resentment toward me for it! She was a 50 year old woman with a grown up son! I couldn’t believe it, first that she would be that malicious and nasty, and secondly, that she could care so much about a game! The next time she posted something on the forums, i replied saying that i knew who she was and if she didn’t stop it, i would tell everyone else who she was. After that, she never bothered me again. I also was very heavily involved in a campaign to improve child protection services and lengthen sentences for child abusers a few years ago, and you would not believe the troll comments we’d have to moderate, particularly after high profile and heartbreaking cases like the death of little baby Peter Connolly. I would never have thought people would be so incredibly thoughtless, uncaring and deliberately upsetting in a million years, had i not seen it myself. The ONLY sucessful response to deal with these kind of people, is to delete their comments and any replies to them, asap. This, coming from someone who thinks free speech is one of the most precious rights we (apparently) have. It’s the ONLY way; you cannot reason with these people, that’s not why they’re doing it. They’re doing it for the reaction, any reaction. That’s why you must remove the opportunity. 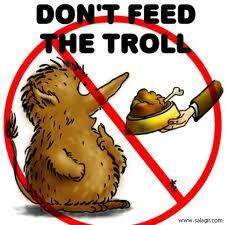 DON’T FEED THE TROLLS! The anonymity of the internet can evoke aggressive and sociopathic tendencies in some strange folk. This is all too familiar. I’m not sure what happens to people on-line … that they would act in ways they’d never act in person.